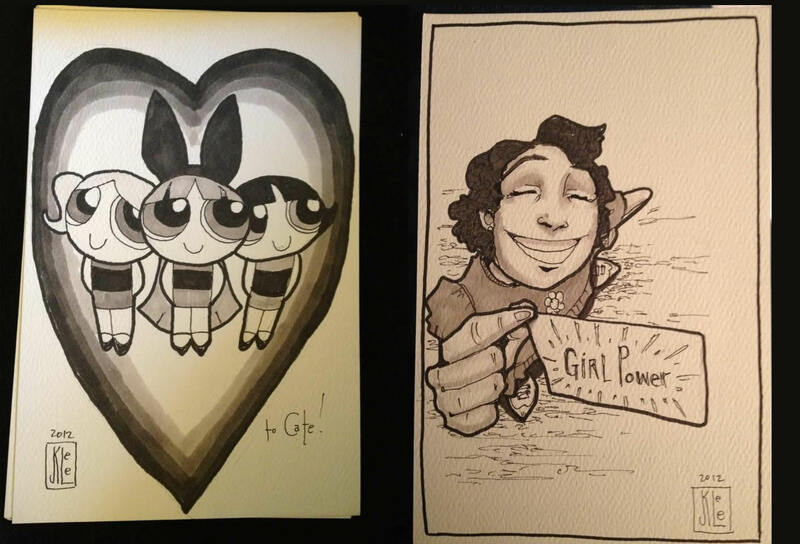 Powerpuff Girls & Paula Pansy by Janet K. Lee! Our super awesome buddy and Eisner-Award Winning Creator, Janet K. Lee, was invited to a Womanthology signing at the awesome Acme Comics in Greensboro (seriously, a comics palace not to be missed) last weekend … and Grace, Cate & I had to miss it. 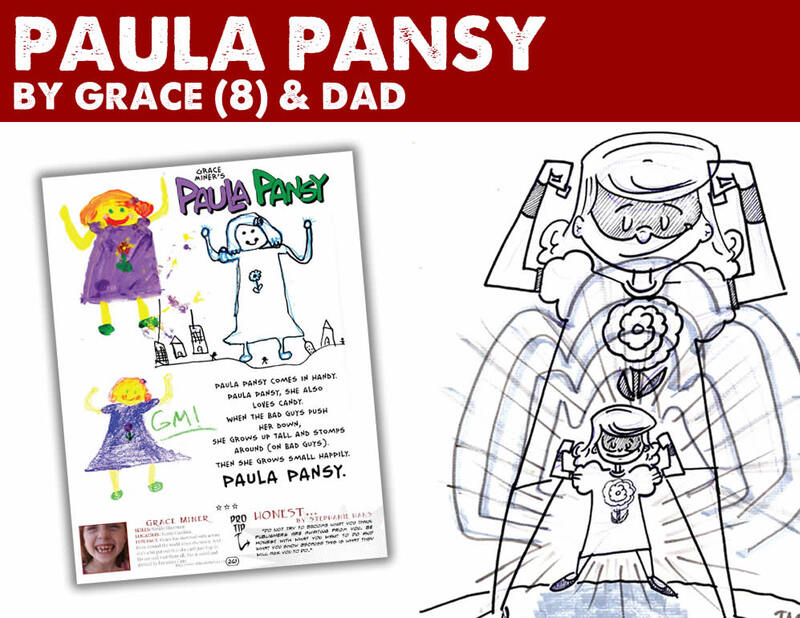 But, Janet created these two incredible sketches for the girls — the Powerpuff Girls for Cate and Paula Pansy, Grace’s creation for Womanthology! So very, very cool. See you at HeroesCon in June, Janet! 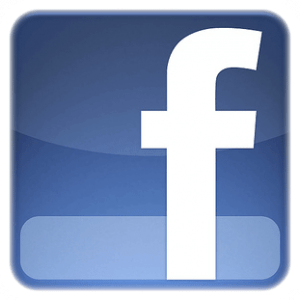 And, now … a word from Janet! A few months ago, we toldja’ that Grace had been given the honor of contributing to Womanthology, a massive collection of the work of female comics creators from around the world. This project was the brainchild of Renae de Liz and will soon hit the shelves. 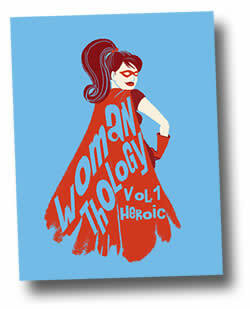 This week, Renae released a preview of the book on the Womanthology, and Grace’s character and poem “Paula Pansy” was among the selected pages. I gotta’ tell you, it was a proud moment for me. Grace, on the other hand, just sees it as part of the regular routine … you know … to be a published author at 8. Thanks, Renae! 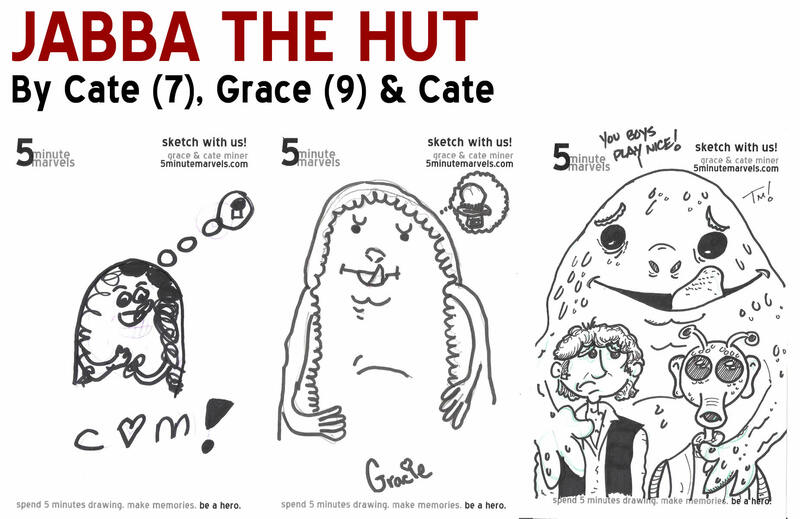 Watch the video above and 50 seconds in you will find something familiar — a drawing by 5 Minute Marvel co-founder and my daughter, Ms. Grace Miner. It’s an exciting achievement for her. And, I’m excited to announce that Grace will be one of the child contributors to Womanthology, a massive anthology comic showcasing the works of women in comics. The book is created entirely by over 140 women of all experience levels. And it’s taking the comics world by storm. Just two weeks ago at ComicCon, a fan questioned DC Comics Executive Editor, Dan Didio, about the lack of female creators participating in the DC relaunch. He responded by asking her who she thought he should be talking to. Now, I wasn’t there, and perhaps it didn’t sound as bad coming out of his mouth as it reads in print. Maybe he was having a bad day. But, Dan, there are hundreds of female artists who could help your books innovate and reach new audiences. Maybe some male readers aren’t ready for that, but it’s their loss. And, Womanthology is aptly timed to demonstrate that. When Womanthology creator Renae De Liz issued an open invitation to women to contribute to her idea a few weeks ago, I can’t imagine she dreamt it would generate the response it has. And, when she tentatively sought $25,000 in funding on Kickstarter, I know she didn’t think they’d be pushing $100,000 with 71 hours to go. She has shone a light on the amazing work women are doing in comics. 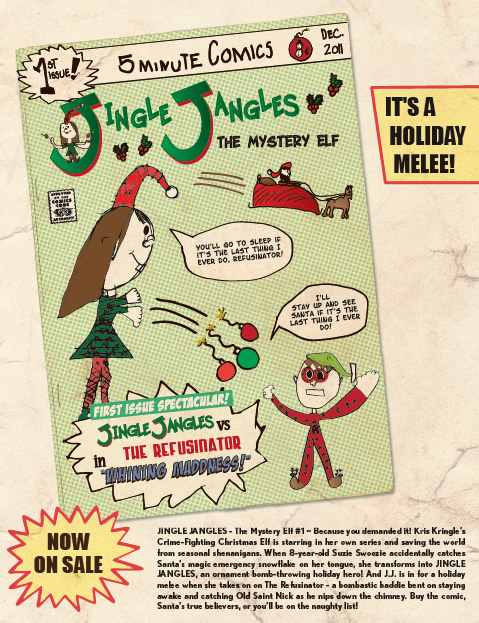 And, she’s demonstrated that mainstream comics are lagging behind. 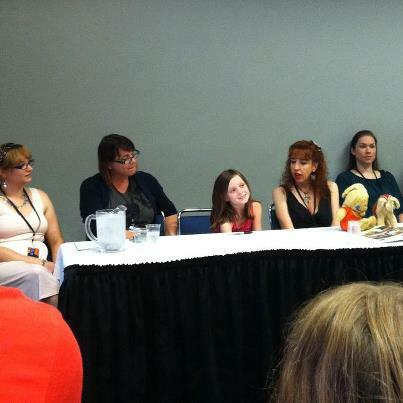 Grace is thrilled to be a part of Womanthology, and I’m proud of her. But, most of all, I am grateful to Renae for the opportunity to show Gracie that there should be no barriers to her creativity, especially not one founded in gender.